Below this text, in reverse chronological order, are some maps from U.S. Southern Command that I’ve collected over the years. 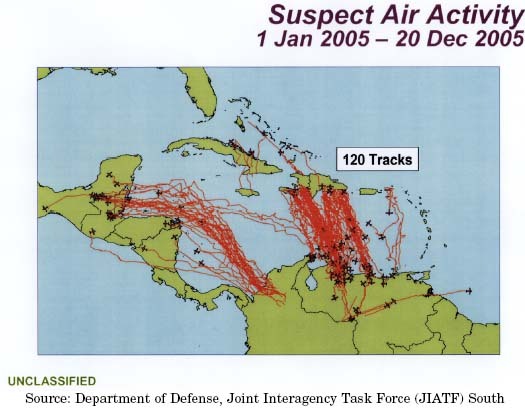 They show the tracks of aircraft or boats that Southcom and its Key West, Florida-based “Joint Interagency Task Force South” (JIATF-South) component has suspected of trafficking drugs (or other illegal things). 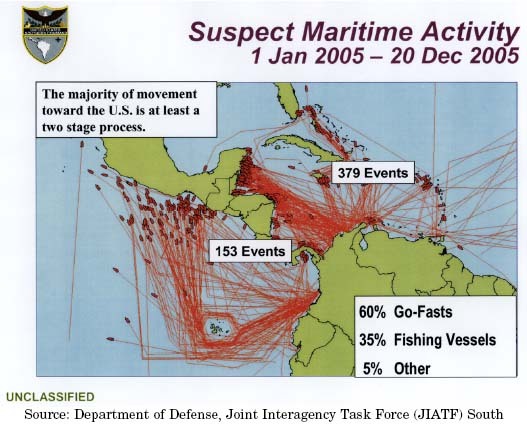 These give you a general idea of how trafficking (I believe this is nearly all cocaine trafficking) patterns have shifted over the past 12 years. The Eastern Pacific is the busiest route. 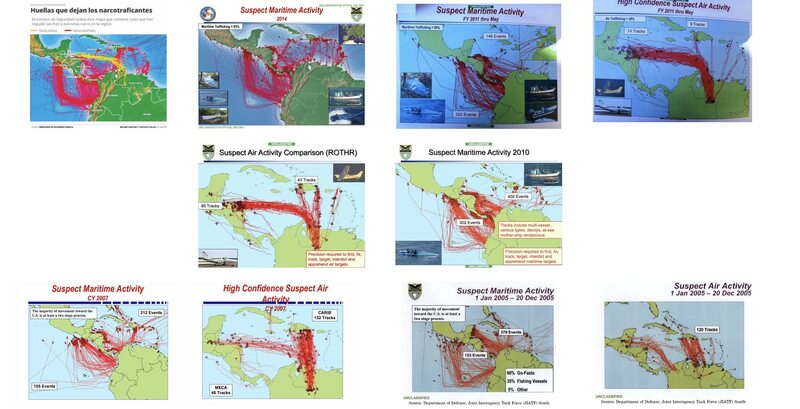 Southcom reported earlier this year that “Eastern Pacific flow currently accounts for more than 68% of documented cocaine movement,” and the more recent maps show that clearly. Colombia’s entire Pacific coast, as well as Esmeraldas and Manabí, Ecuador, are the main launching points for maritime traffic. 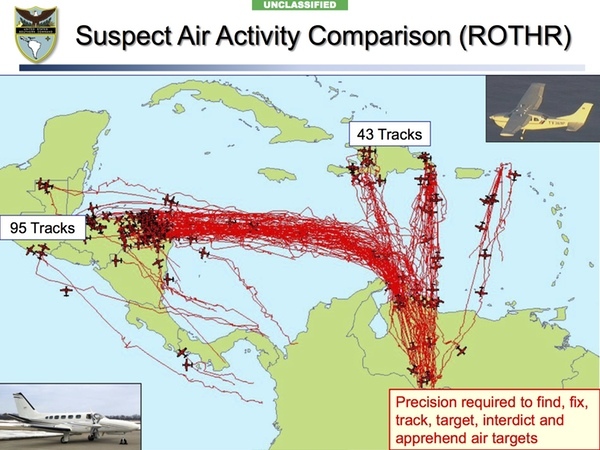 (Southcom estimates that, after steady decline, only 3 percent of cocaine trafficking from the Andes is aerial; the rest is maritime.) 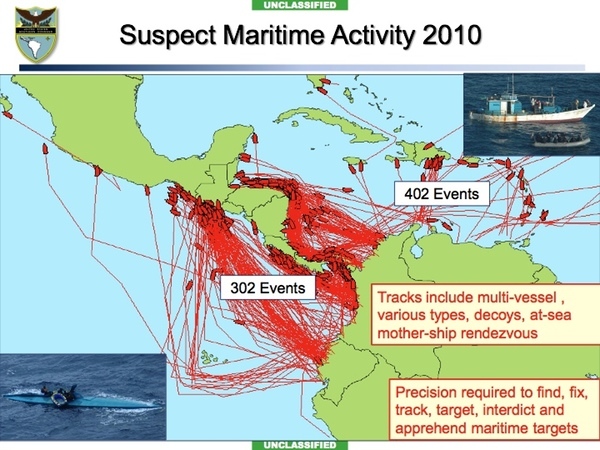 For a while, detected trafficking vessels were not going out as far as the Galápagos Islands, which requires larger boats full of fuel to be stationed in the deep ocean, but now that long-haul route is active again. These long hauls tend not to arrive in Mexico, other than Chiapas which, along with San Marcos and Retalhuleu, Guatemala, remains a very heavy destination. Costa Rica and Panama have been increasingly inundated with maritime traffic, which now blankets their heavily touristed coasts. In the Caribbean, Puerto Rico appears to have seen a very sharp increase too. 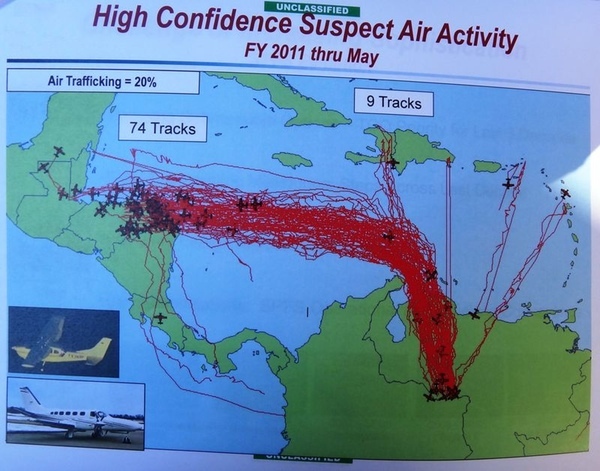 The Venezuela-to-Honduras aerial route, from Apure to Gracias a Dios, remains active, though overall aerial trafficking is reduced. 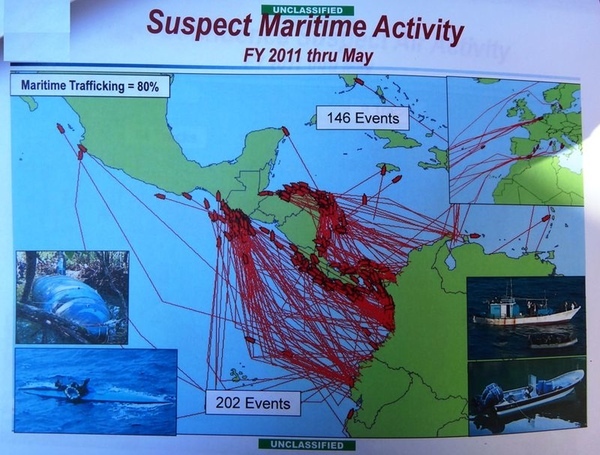 Traffickers tend to avoid Cuba, Haiti, and Nicaragua. (The 2016 map reverses Haiti and the Dominican Republic on the island of Hispaniola.) 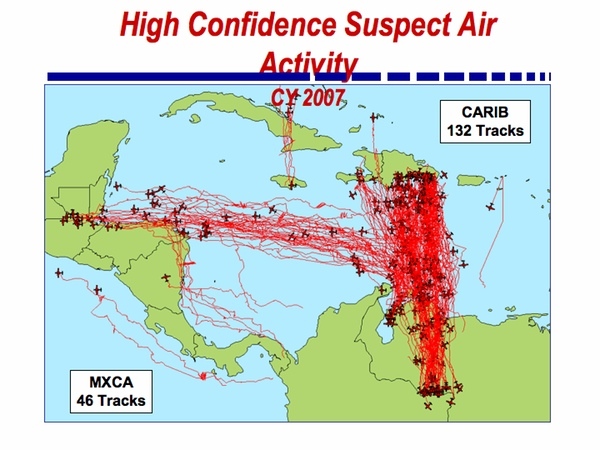 The lack of tracks detected in Cuba is total in recent years, which is remarkable. These aren’t secret or classified, but I don’t know why Southcom and JIATF-South don’t just put these on their websites and in their reporting to Congress and the media. It’s about telling your own story.